Gaslight Anthem front man Brian Fallon is back with a brand new solo album titled “Sleepwalkers”. The twelve track album is being released via Island Records as was produced by Ted Hutt. As the follow up to Fallon’s 2016 solo debut “Painkillers”, “Sleepwalkers” continues on with the front mans raspy, old timey style long time fans have come to love. Two parts Dylan and two parts Springsteen is how I like to best describe Brian Fallon’s music. “Sleepwalkers” fits that description perfectly as the albums twelve tracks blend the singer/songwriters love of folk and rock into one unique package. Much like Fallon’s previous works “Sleepwalkers” paints a lyrical picture of classic Americana elements as tracks like “Forget Me Not” and “Neptune” talk about lost love and missed opportunity while being sung against robust, upbeat instrumentation while, tracks like “Etta James” and “See You on the Other Side” feature a more scaled back folk like style which nicely showcases Fallon’s vocal style. Probably my favorite track off the album was the Clash esque “Come Wander with Me” which comes complete with a quasi reggae beat, a catchy chorus and, a line taken from the Clash’s song “Bank Robber” acting as the cherry on top of a proverbial music sundae. 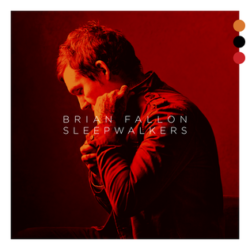 “Sleepwalkers” might not be as strong of a release as its predecessor or when compared to some of Fallon’s previous other works however, the album certainly shows progression. As an artist Brian Fallon is not afraid to brave new ground or try things out of his comfort zone and his latest release is a testament to that. If you are looking for a nice mixture of poppy infused rock with classic folk elements then “Sleepwalkers” is the album for you. The Gaslight Anthem front-man Brian Fallon steps into the solo spotlight with his debut release titled “Painkillers”. The album which is being released via Island Records features 12 brand new tracks from the Springsteen esk front-man which were produced by Butch Walker (Weezer, Fall Out Boy). Brain Fallon’s first attempt as a solo artist comes off completely genuine and harkens back to the singer/songwriter era of the early 60’s but with a modern twist. Tracks such as the albums opener “A Wonderful Life” and the title track “Painkillers” are similar enough to Fallon’s previous work with his band The Gaslight Anthem that they will appeal not only to long time fans but also usher in a new fan base for the charismatic singer. Other tracks worth mentioning are the gravelly voiced “Smoke” with its jangly guitars and sing-a-long choruses to the upbeat “Rosemary” which is one of the few songs on the album to feature electric guitar and provides a nice break up mid way through the album which is almost entirely acoustic. Along with Fallon the album features some great performances by Brian’s backing band consisting of Mark Stepro-drums, Catherie Popper-bass, Alex Rosamilia-piano, Josh Keller-pedal steel guitar and Butch Walker who along with his producer duties lends his hand playing a variety of different odds and ends instruments. When a debut solo album comes out and is as strong as one such as “Painkillers” it makes me wonder if the artist left any ground to cover for future albums. With the diversity shown by Fallon and company that question was quickly answered as the album runs the gambit of music styles which will certainly help pave the way for future releases from the seasoned front man. “Human Conditional” is the first solo release by founding Kittie vocalist/guitarist Fallon Bowman. The album features 11 new tracks that cover a variety of musical genres. “Human Conditional was produced by Justin Johnson and is being released via Bowman’s own record label Social Unrest Records. The band consists of Fallon Bowman on Guitar/Vocals, Josiah Sherman- Keys, Keith Lowe- Bass, Brian Oaks- Guitars and Justin Johnson- drums, keys and back ground vocals. “Human Conditional” is the follow up release to Bowman’s previous band Amphibious Assault’s 2007 album “On Better Days and Sin-Eating”. I was very surprised upon listening to “Human Conditional”. Until now I always had the picture of Fallon sporting bright pink/red hair screaming lyrics to songs like “Brackish”. However “Human Conditional” showed a side of Fallon that until now I don’t think I or many others had seen before. Songs like “Force Me Not To Breathe Again” and “Make Up Your Mind” sport catchy choruses that have you singing along on the first listen. While the synth infused “Mistake: Retake” combines heavy guitars with Bowman’s melodic vocal stylings. “Human Conditional” features a great mix making all the instrumentation contained on the album really enjoyable to listen to. Fallon Bowman’s “Human Conditional” is a great listen from start to finish. Though much different than her previous releases the album is very fresh. “Human Conditional” might not be heavy enough for fans of Fallon’s previous work but for me “Human Conditional” had everything I look for in an album. Fallon Bowman shot to stardom in the mid 1990’s with the popular all girl heavy metal group Kittie. Since leaving the group in 2001, Fallon has been a part of several other music projects and most recently she has released her first solo album titled “Human Conditional”. Media Mikes had a chance to speak with Fallon recently about her career in the music business and what it was like for her releasing her first solo album. Adam Lawton: What was it like leaving Kittie which was a band you helped start when you were still in high school? Fallon Bowman: It was awful! I actually just wrote an essay about how that departure affected me now and how I have grown since that point. I think I have grown tremendously since that time but it really was a pivotal moment in my life where I couldn’t go on both physically and mentally with the band. It was also difficult because I was losing friends as a result of leaving. When this was all happening we were just kids and relationships were left strained. Today everyone is cool but at the time it was really difficult. I don’t think I left my house for about a year after all of that. I just didn’t know what to do with myself. Luckily I had and still have a very strong friends and family base that were and are there for me. AL: Was it hard for you being in music business at such a young age? FB: I think so. Thankfully I had strong families ties and when dealing with things I had my parents behind me a 100 percent. I don’t think I was really ready or prepared to deal with the amount of responsibility that was given to me. People were looking up to me to do all the right things and I was just a kid. It was very difficult to deal with. At the same time I think I sort of went through everything sort of oblivious and I wished I had paid more attention to certain things that were going on around me. Everything happened so fast from the time we toured with Slipknot in 2000, it just went crazy! AL: How do you think music industry has changed from when you started to now? FB: Oh my god! Drastically! Back when we started promoting and doing things with Kittie we didn’t really focus on the internet and at the time there was no Facebook or anything like that. We had a Geocities website starting in 1996 until we got signed in 1999 that never really worked out that great. So everything that happened for us came from playing and people talking about the band. At the time we started it was all about street teams made up of fans that would put the word out for each band. That really was the big thing then and when you think about it now how many people actually do things that way anymore? It’s an incredible learning curve now. I am constantly having to learn and be told about new websites and ways to get you material out there. It has been incredible to try and just keep up. I think the music industry is so schizophrenic and all over the place that we can’t get things together as everything is all over the place and moving super fast. It’s just overwhelming at times. AL: Can you tell us about your label Social Unrest Records? FB: I started that in conjunction with my previous project/group Amphibious Assault. I really was using it to help build a brand around myself. It was perfectly in line with my very heavy political agenda at the time. Over the years I have done some other things with the label and the political aspect has died down a bit but I am really starting to look into making it something that is viable. I want to make it more than just me on there. The big thing is that the traditional record label that I am thinking of in my head is very hard to maintain. I think I will have to be very innovative and come up with something new. I would like the label to have a very definitive sound and aim. AL: You mentioned Amphibious Assault. Can you tell us what’s going on with that project? FB: That was really my break into the hard industrial music world. I love electronic music and Amphibious Assault was sort of my homage to my KMFDM days, when I was obsessed with them. There were a lot of heavy aspects to the project but it also allowed me to develop my singing voice. The group was fairly well received by certain groups. My main reason for moving on from this project was that I always wanted to have different things going on every couple years. FB: After ending Amphibious Assault in 2007, I went and finished university and sort of floated around for a bit. I was still writing music but I wasn’t sure where I wanted to go with it. A friend of mine approached me and asked if had any songs that I would want to do a video for. I had one song that was done and recorded so we ended up working with that. My friend was the one who sort of kick started the project. I really wasn’t thinking of doing anything with it but the song sort of took on a life of its own. AL: The album is much different that your previous work. Are you more a fan of more melodic music as of late? FB: Lately yes. I will always love metal and have a strong appreciation for it. People still know me as a metal artist, so it’s been interesting. I really enjoy doing more electronic based music and music I can sing to as opposed to screaming/yelling. I don’t think my voice was ever really meant to do that. AL: What other type of things do you have going on or coming up in the future? FB: I have tons of stuff going on right now! I have teamed up with two local electronic musicians and I am super stoked for this project. The two guys have been looking for someone similar to Portishead to sing over their music. Through mutual contacts we have somehow got together and are working on music as we speak. Hopefully things we be happening within the next month with that project. I am also still developing my record label to incorporate multiple types of entertainment. I have also started to write the follow up to “Human Conditional”. I really should take a break but I just can’t right now.